Last Saturday our Lions Club of Mombasa Bahari hosted yet another successful poetry recital competition for children between the ages of 4 to 7. Please do take some time and visit the website. Poetry recital not only helps a child to develop confidence, but also improves their diction, voice control, helps them to learn new vocabulary, helps with memorization skills and prepares them for public speaking.Like reading, poems too are the mind’s adventure for the children. Reciting and understanding the poems also helps them to pretend and perform actions and expressions accordingly. This year the poems given to the 6 -7 year olds were a bit long, but surprisingly they managed to memorize it within 2 weeks. We tend to underestimate a child’s brain. There is always room to learn new things. Recently, friends and cousins sent a video on whatsapp showing how toddlers are able to tell you the capital cities of many countries. When I saw the clipping, I felt sad. Sad because this toddler was taught to parrot off the cities without even really understanding what he is asked, where the country and where the city is. Why would parents want to waste time on rote learning instead of teaching children to learn something that they can understand, enjoy and have fun.We generally begin with nursery rhymes and short fun poems which are famous in every culture and language.In India we have chanda mama or “aawyo varsaad, ghebriyo parsad, unni unni rotli ne karela nu shaak”. A famous Gujarati rain poem which I remember my mum taught us.Coming back to the poetry recital, all 75 children oozed with confidence and all of them remembered their lines. In a situation like this I am glad I was not the judge. Its a very tough task. Today’s recipe is a wrap. On days that I don’t feel like cooking we normally order wraps from a restaurant near our apartment.The wraps are not only delicious and filling, but hubby loves that the wrap as they are soft. Most other wraps I have had in India are a bit tough especially when they get cold. So when I told hubby dear that I was going to makes wraps for dinner, he just said “make any filling of your choice but the wrap must be soft”. So just ordinary roti dough would not do. I added a bit of baking powder to the dough and got lovely soft home made wraps. Should children learn through fun and games or through rote learning? Add oil and mix into the flour. Add water and form a dough which is not too soft or too hard. Cover and let it rest for at least 30 minutes. Heat a frying pan or tava over medium heat. Divide the dough into 8 parts. Roll the parts into a ball. Using the extra flour, roll each part into a circle of 7-8 inches in diameter. Cook the wrap on both sides till light brown spots appear. Cover the wrap in a cloth. Repeat steps 8 to 10 with the remaining dough. Add the cumin seeds. Add garlic and stir fry till its a bit soft. Add the sweet potato cubes, salt and water. Mix well. Cover the pan and let the sweet potato cook over low heat. When the sweet potatoes are done, add the rest of the filling ingredients. Cut the avocado into 8 slices. Sprinkle the lemon juice over it. Warm up the wraps and the filling. Spread a bit of salsa or guacamole in the middle of the wrap. Take about 2 tablespoonful of the filling and place it over the salsa or guacamole. Wrap both ends of the wrap towards the middle. I prefer to cover half of it with a foil or parchment paper. This makes it easier to hold the wrap together. Repeat steps 2 to 6 with the remaining wraps and serve with a salad on the side. use half wheat flour and half plain flour for the wraps. Add cheese to the wrap if you like. Add any vegetables of your choice. 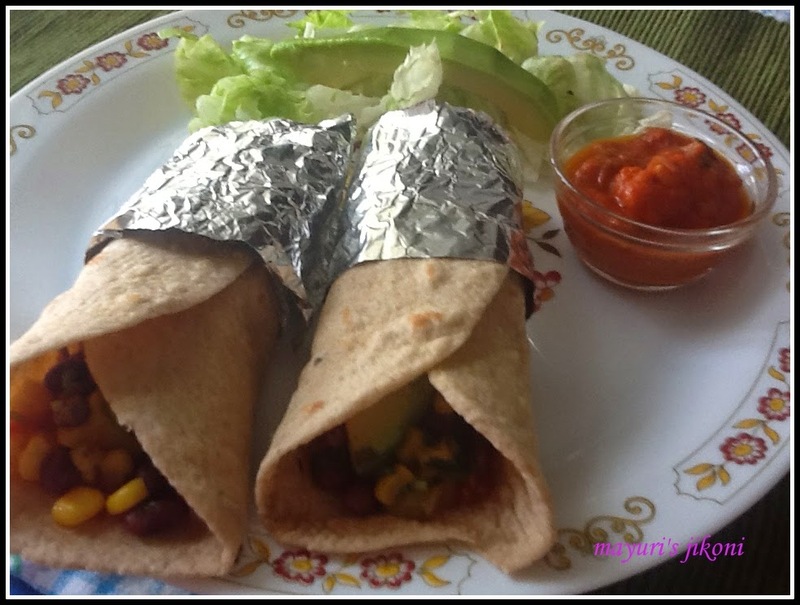 Very healthy wraps for kids,even we can also enjoy. The filling looks so colorful and delicious, healthy wraps..
My little girl goes to a school where they emphasise on children having fun and enjoying the process of learning. This was the utmost criteria for us while choosing the school for her. I am totally against rote learning which I and my friends did a lot while growing up. We used to tell learning for exams which never helps in the long run. And as for the recipe I loved it immensely. Wraps are my favorite too. Can fill it with a variety of things. Love the filling you have used. such a yummy wraps !